Feeling blue today? 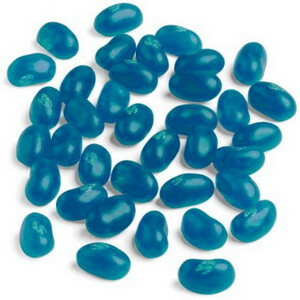 Cheer up with a bag of these blueberry jelly beans. Their sweetness and wonderful blueberry flavor are sure to put a smile on your face. Sugar, corn syrup, blueberry puree, modified food starch, contains less than 2% of: citric acid, natural & artificial flavors, artificial color blue #1 lake, beeswax, caranuba wax, and confectioner's glaze.